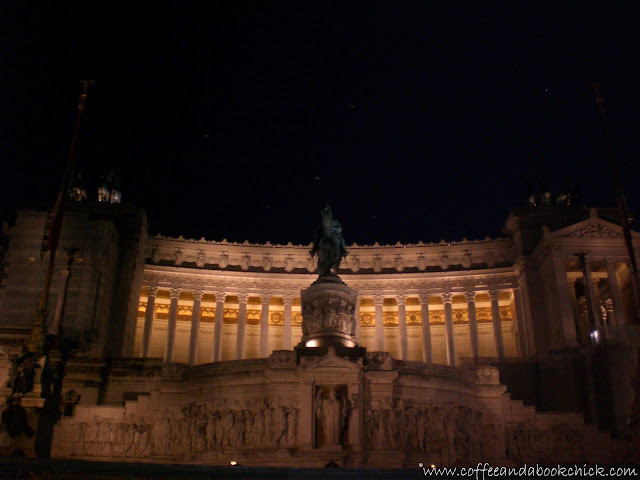 Coffee and a Book Chick: Saturday Snapshot.. Monument to Vittorio Emanuele II...Rome. Saturday Snapshot.. Monument to Vittorio Emanuele II...Rome. Yet another picture from my honeymoon to Italy two years ago. This is the Monument to Vittorio Emanuele II. Sometimes referred to by foreigners as "the wedding cake," and by local Romans as "the typewriter," it was completed in 1935 to honor the first king of a unified Italy. There is quite a bit of controversy surrounding the construction of this, since because of its vast size, they had to destroy a large section of Capitoline Hill and apparently a medieval neighborhood with it. People also think it's too big, but it is breathtaking when standing before it. Click here to see another one of my favorite shots of it at sunset. Nice nighttime picture - love the sunset one, too. Oh, yes, I agree, this is a beautiful place! Thanks for sharing this photo with us. I am living vicariously through these pictures! I can see the "wedding cake", but having a hard time envisioning a typewriter. I wonder what that medieval neighborhood would have looked like. Gorgeous! I do enjoy the nighttime look of it, with lights aglow. That is quite a monument! You must feel that soaring in your soul every time you think of that Italian honeymoon. Great photo. What an amazing piece of architecture!! I saw the wedding cake more immediately than the typewriter. It is a beautiful building! The building is stunning, really beautiful, huge, too! I love that the photo is taken at night because the lights on the building look great! Gorgeous! My husband and I are tentatively thinking about a Mediterranean Cruise next summer with the kids, in which we will see Rome. I've always wanted to go. Gosh, I can certainly see why they called it The Wedding Cake. It's so . . . white. Something about this night photo is just stunning! Very impressive building. The night shot really makes it stand out. Didn't know the history behind it, I thought the building was older. Oh wow! Gorgeous picture! I wish to go there some day too.